There’s been some debate about the emphasis of story structure before you even begin writing over the years. As usual, it comes down to what kind of writer you are. The biggest knock against it is that having too much of your story beats planned out takes the fun out of writing it in the first place. It becomes too formulaic. Too dull. I’ve come to the conclusion that if I need to label myself into a writing category, I’m probably most like a “plotter.” I need an outline to show me where I’m going and as a resource to collect all of the random scraps and pieces and I can’t use in my current scene but I know will show up later. My outlines tend to be detailed in some places and incredibly vague in others. It’s my road map that gets me where I need to go. This is the first time that I built in actual story structure beats right into the outline. Up until now, I’d like to think that I had an intuitive notion of what needs to go where. I wasn’t always right, but that’s kind of the point. So this time, I have the thing divided into the four typical parts with a few notes to myself at each junction to remind me not to make the protagonist too awesome yet or remember, the guy should be scared at this point. It’s definitely helping keep the story on track, but more than that, all of these beats give me something to shoot for. Normally, I’m driven by A.) the ending and B.) at least one really cool scene that I’ve been thinking about since I’d even begun writing. But now, in addition to A and B, I have all of these smaller destinations to gear up for. If anything, I feel that it’s helping my pacing and lets my story breathe as I work up to such and such and then fall back down again for the effects. Established writers, you may be smacking your foreheads right now and saying “duh,” but I wanted to point this out for anyone else who’d been teetering on the fence with me. This whole novel so far has just been chock full of revelations for me. So much so that I was able to convince my wife to let me write when we go away next week. When it comes to our Disney vacations, I write like a maniac beforehand and then make up my lost work afterward. Usually, we’re too busy during the trip for me to get any time to actually sit down and write. If anything, the only battle I pick is to go running a few mornings before whatever else she has planned starts. This time around, we have next to nothing going on. That’s the whole point. We want some rest and relaxation and with her being uber pregnant, she’s going to want to take it easy. It was her idea for me to bring the netbook this time! 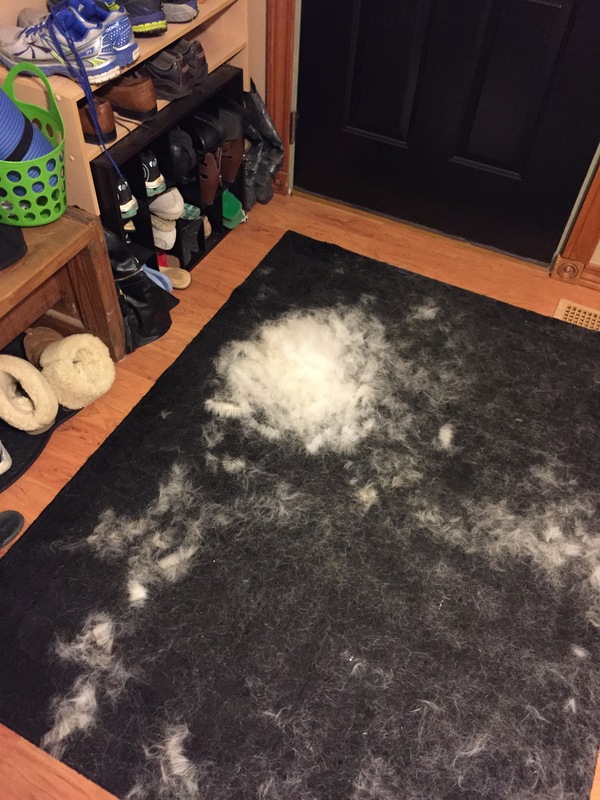 It’s shedding season, so that’s awesome. 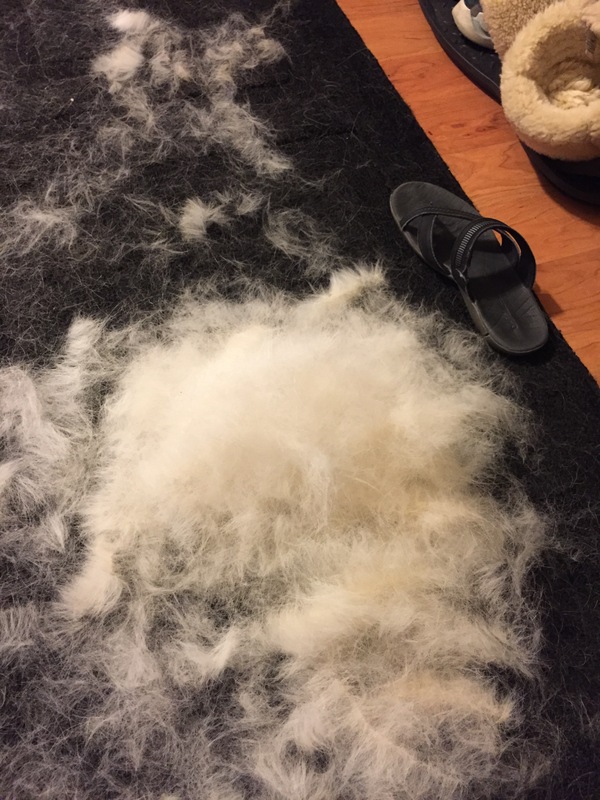 I pulled all of this off of my dog last night. Here’s a closeup and a sandal to show the scale. I’m seriously considering saving all of her fur and stuffing a pillow. Then I will send that gross pillow to my brother because who really wants a pillow stuffed with dog fur? 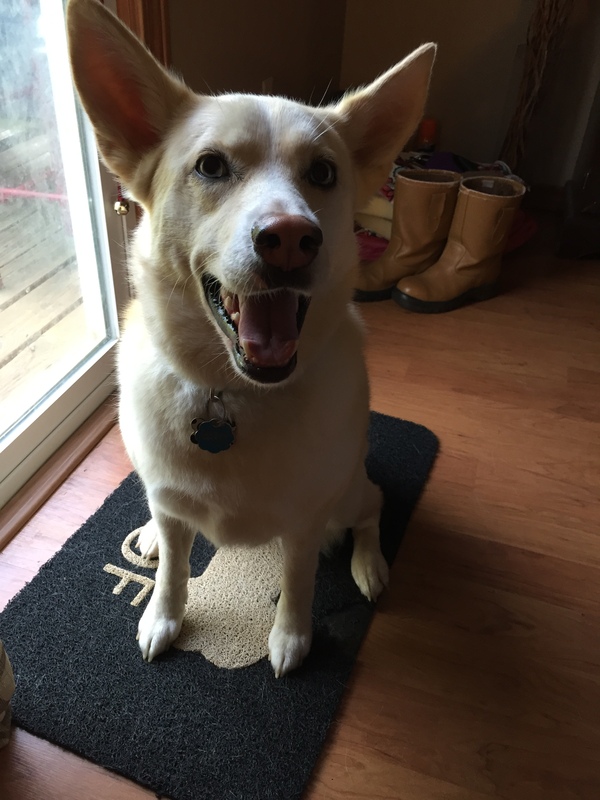 Regardless, she looks pretty happy. I probably won’t be posting next week. All of that time will be used for writing, running and probably eating instead. Hope you all have a good week and I’ll see you when we get back!